Inder Loves Folk Art: The 100 Foot Diet Challenge. 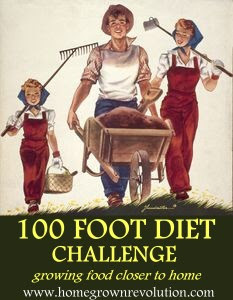 I've decided to take on the 100 foot diet challenge - make one meal a week from as many homegrown products as possible. (For more details, click on the poster.) Now, we do not grow our own wheat, nor do we have chickens or a dairy cow, so there are limits to what we can cook solely from our backyard. But as long as the challenge is "as much as possible," I think we can do it. And as Rebecca points out, we definitely won't have to worry about scurvy. Not that scurvy is a major killer of land-lubbin' vegetarians. Also, I love the poster! Garden propaganda is so cool! Anyway, by late-summer, this'll be a piece of cake - by then, we'll feel guilty if we eat a single tomato- or zucchini-free meal. The fun, challenging part is right now, when it's slim pickin' out there. Kale and chard with lemon and chervil, anyone? kale and chard with lemon and chervil sounds heavenly to me. Kale chips = ridiculously fun snack.